NORTH VANCOUVER, B.C. Qualex-Landmark™, the developers of GREEN on QUEENSBURY, held a ground breaking ceremony on October 17. The ceremony marked the beginning of construction on the $100 million condominium project in the soon-to-be revitalized Moodyville neighbourhood. Green on Queensbury is comprised of three four-storey buildings encompassing a full city block targeting “LEED Gold for Homes Multi-Family Midrise” standard. It is currently over 80 per cent sold out of its 164 one, two, and three bedroom condominiums, garden homes and park-front townhomes. Construction is expected to be completed early 2020. According to the Real Estate Board of Greater Vancouver (REBGV), residential sales in the Greater Vancouver region increased by 25 per cent in September 2017 compared to the same month last year to 2,821 up from 2,253. In North Vancouver apartment condo sales increased by 10 per cent with 107 sales in September 2017 compared to 97 sales in September 2016. Mayor Darrell Mussatto, City of North Vancouver, Mohammed Esfahani, president, Qualex-Landmark™, Marco Paolella, president, Marcon Construction and representing the architectural team, Stu Lyon, principal, GBL Architects, and Mike Derksen, PFS Studio landscape architects, were on-site with hard hats and shovels for the ground breaking ceremony. Green on Queensbury is North Vancouver’s first large scale and fully parkside residential community and Qualex-Landmark™ has contributed more than $5 million in development cost charges and community benefits contributions. Approximately $3-million will be allocated by the City to support the complete revitalization of Moodyville Park, significantly enhancing this natural element and lasting community benefit to the Moodyville neighbourhood and Green on Queensbury residents. Green on Queensbury is the newest addition to the Qualex-Landmark™ group’s portfolio of award-winning communities. Spanning the entire 700 block of East 3rd Street at the foot of Queensbury Avenue, includes apartment condos, garden homes and two-level park-fronting townhomes that will range in size from 517 to 1,546 sq.ft. 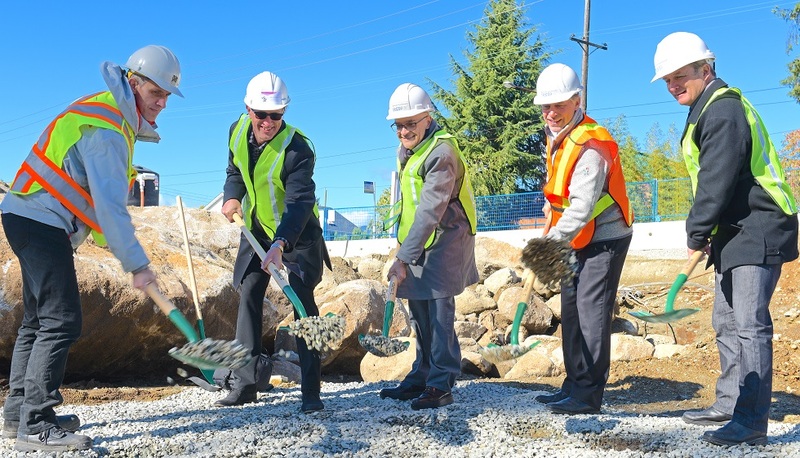 Photo caption: Architects, builders, and the Mayor conduct groundbreaking ceremony for $100 million North Shore condominium project from Qualex Landmark. (l-r) Mike Derksen, associate ,PFS Studio landscape architects, Stu Lyon, principal, GBL Architects, Mohammed Esfahani, president, Qualex-Landmark, Mayor Darrell Mussatto, City of North Vancouver, Marco Paolella, president, Marcon Construction. Green on Queensbury is nestled on the historic and soon to be revitalized Moodyville Park which is located on a hillside between the Low Level Road and East 3rd Street. Currently unwelcoming and underutilized by the public, significant revitalization of Moodyville Park is now on the horizon stemming from the proposed Green on Queensbury residential community. The Qualex-Landmark™ group has more than a quarter of a century of residential and commercial development experience in the highly competitive British Columbia and Alberta markets. With praise from customers and peers alike, they have earned a notable reputation for innovative and distinctive architecture, and take pride in creating thoughtful and enviable communities people are proud to call home. Anyone interested in receiving updates and learning more about homes still available at Green on Queensbury should register at qualex.ca/green/. The discovery centre is now open daily from noon to 5 PM (except Fridays). Book an appointment to view the fully furnished show suite by calling 604-990-8800 or visit 50 Queensbury Ave, North Vancouver (at East 3rd Street & Queensbury Ave). For more information on Green on Queensbury visit qualex.ca/green/. Green on Queensbury is the first large scale and fully parkside residential community to lay down its roots in the soon-to-be revitalized Moodyville neighbourhood in the City of North Vancouver. Spanning the entire 700 block of East 3rd Street at the foot of Queensbury Avenue, it will encompass a rare mix of contemporary west coast architecture and natural beauty with exceptionally-designed one, two, and three bedroom condos, garden homes and two-level park-front townhomes. Green on Queensbury is the newest addition to the Qualex-Landmark™ group’s portfolio of award-winning communities. ™ denotes one or more trademarks of Qualex-Landmark Management Inc. used under license by Qualex-Landmark Northern Limited Partnership.